In the last year, group-deal sites like Groupon and LivingSocial have surged to success. Now that it’s clear that this is a market that isn’t going away any time soon, we’re starting to see businesses being built around these deal sites. Today sees the launch of a new startup that’s doing just that: it’s called CoupRecoup, and it’s looking to become a sort of secondary market for deal sites, allowing users to sell off the coupons they’ve purchased but don’t think they’ll get around to using. The appeal of the site is obvious: Groupon and similar sites offer very tempting deals that people are likely to buy impulsively. Thing is, they also expire — CoupRecoup gives them a way to make back at least some of their money. To get started, you enter the original URL of the deal you’re selling, your asking price, and your email address (you don’t need to make an account). The site will let you sell coupons purchased from any site, and for the bigger sites, like Groupon and LivingSocial, it will automatically scrape information that’s relevant to the coupon you’ve posted (data like its original price and description). CoupRecoup doesn’t charge anything for this — in the future it may consider adding transaction or listing fees. Update:: It’s worth pointing out that Groupon actually lets you get a refund on its coupons, no questions asked, though other deal sites may have less liberal return policies. 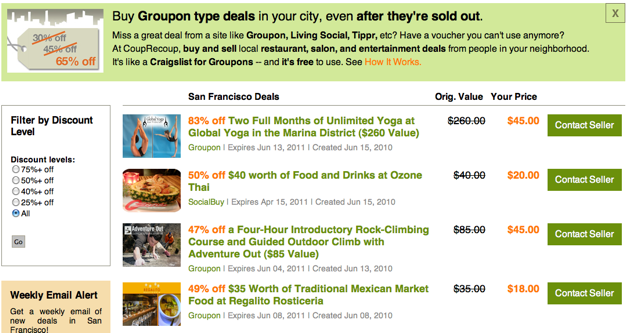 CoupRecoup is a good idea in the sense that Groupon and similar discount sites are quickly catching on. But it also faces a lot of hurdles. First, there’s the issue of whether or not these coupon services will actually allow users to resell their coupons. Founder Aren Sandersen says that at this point the Terms of Service of these deal sites tend to be vague, and that it isn’t even clear if they can legally prohibit people from reselling their coupons in the first place. There’s also the issue of actually exchanging these coupons. Like Craigslist, CoupRecoup doesn’t handle transactions — once you’re paired with someone selling a coupon you want, you figure out how you want to exchange the money and the coupon. Assuming you trust the person you’re interacting with that’s easy enough (you can Email or fax a coupon, and send money via PayPal, for example). But with coupons there may be a greater risk for fraud than you’d have with physical goods, because it’s so easy to duplicate or simply not forward your coupon after receiving the money. Sandersen says that the startup will be keeping an eye on this and may implement a system to help facilitate transactions in the future. In the shorter term, the site may add an eBay-like reputation system. I suspect CoupRecoup will be quite controversial (assuming it can gain traction). In particular, I’m wondering how the vendors offering these deals in the first place will respond — they may be happy that they’re drawing new customers, but they may have also factored in the fact that some people wouldn’t redeem their coupons when they originally priced them; CoupRecoup could impact the redemption rate. It’s also possible that prices on CoupRecoup will actually be higher than what they originally sold for on Groupon, as dealhunters buy up all the good deals and attempt to sell them at a profit.